We’re used to thinking of monkeys as our distant ancestors in the orderly and methodical progress of evolution from generation to generation. But most of us would be shocked to know that each one of us is part bacterium– not from millions of years ago, but from much more recent changes to our DNA. 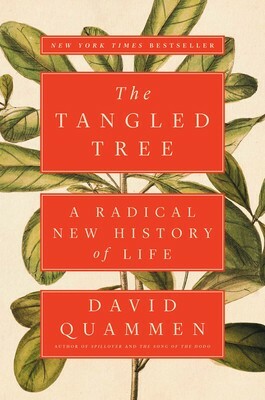 In David Quammen’s new book, The Tangled Tree: A Radical New History of Life, we discover that the tree of life isn’t as simple as we once thought. Charles Darwin drew the first ‘tree of life’ in 1837. It was quite rudimentary, with only two main branches — but at the time, it was revolutionary, suggesting that all life came from one common ancestor. Over the following century, evidence of evolution and the tree of life poured in. Dozens of scientists made discoveries that supported and changed the shape of the tree. They first tracked evolution using plants’ and animals’ shape, size, and structure. In the late 1860s nucleic acids (DNA and RNA) were discovered, though it took 90 more years to understand that they were roadmaps of evolution, too. Vertical gene transfer, such as the transfer of genetic material from a mother and father to their offspring, is and was widely accepted. But it turns out that genetic material can bypass billions of years of evolution, going from bacteria or virus directly to a human. This huge leap, known as horizontal gene transfer, was first discovered in bacteria as the mechanism of antibiotic resistance. In the 1990s, scientists slowly acknowledged that horizontal gene transfer was in fact happening between species, and had been for billions of years. Quammen leads us through the twists and turns in the story of evolution with gripping, first-person narrative. His unlikely protagonist is not Charles Darwin or Francis Crick, but rather a biologist named Carl Woese. Woese became a professor in the Department of Microbiology at the University of Illinois at Urbana in the early 1960s. His approach to classification was novel and controversial. Rather than relying on DNA, he compared the RNA that comprises ribosomes, a part of the protein-making machinery of every living thing on Earth—bacteria, fungi, plants, mammals, you, me. Ribosomes have a telltale RNA species (rRNA). Woese recognized this as a unique molecular fingerprint and used it to identify the similarities and differences between organisms. This resulted in one of the first radical changes to the tree of life: a third kingdom for single-celled microorganisms called Archaea. The changes didn’t stop at the addition of a new limb. Quammen also introduces us to Fred Griffith, a British bacteriologist, the first to recognize horizontal gene transfer (the transfer of genes or small pieces of genes between different organisms) in bacteria in 1928. This phenomenon wasn’t more widely recognized until the early 2000s with the sequencing of the human genome. Quammen, a veteran science writer with fifteen books under his belt, tackles the immense challenge of recounting this history. Molecular phylogenetics, as the field is known, is a daunting topic even for molecular biologists like myself. The Tangled Tree takes us on a scientific journey through this radical new version of evolution, and Quammen’s first-person narrative makes us feel as though we were there every step of the way — from Darwin’s first theories of a tree of life to the mystifying notion of bacterial genes working themselves into our DNA. One of the virtues of Quammen’s account is that it isn’t just about the science, but also about the scientists at the forefront of evolutionary findings. They are much like the current ‘tree’ of life itself: They are all connected and intertwined. One’s graduate student becomes another’s postdoc. One’s technician takes their skills and knowledge to advance another’s lab. Good friends and collaborators become fierce competitors in a heartbeat. The Tangled Tree not only allows us to appreciate the tremendous revelations in evolutionary discoveries, but Quammen helps us develop relationships with the scientists whose lives are intertwined. The sheer length of The Tangled Tree may keep you from picking it up. Don’t let it. The subject is complex, but it represents a thrilling new chapter in the history of evolution. Sit back and let David Quammen lead you, limb by limb. His digressions may lead you down a weak branch, but he will pull you along (even horizontally) to a sturdy offshoot. Beth Walters is a postdoctoral fellow in microbiology at NYU. Originally from Wisconsin, she received her doctorate in microbiology from the University of Alabama-Birmingham. When not in lab, she spends her time harassing her dog and cheering on all Wisconsin sports.